Here’s an eye-opener. Discover How You and Your Church Can and Should Join the New Apostolic Revolution! Pastors, you don’t have to “go it alone” any longer . . . I began working with apostles in the 1960’s. These highly gifted mentors formed foundations in my life. Later, church crisis and personal agony drove me to in-depth Bible study and research. This 168 page book guides you in your relationship with any apostle. This information can revolutionize your life and ministry. May God use it to bring you liberty and hope. This book is a compendium of over 50 years of study and experience with apostles. Too many apostle books are written by professors whose books are filled with theories of how “things ought to be.” This book rings with the reality of “how things are” and serves as a practical manual for any pastor or church who wants to pursue a relationship with apostles. Thorough—the book analyzes every church in the NT in it’s relationship to an apostle. All too often pastors and commentators have seized on one church, particularly Corinth, to the exclusion of others. They come away with unbalanced or erroneous conclusions. This well-researched, fact-filled treatise presents a treasure trove of information and serves as a miniature library in your hands. Many books focus on Peter and Paul and how they related to churches. That’s OK if you’re satisfied with one side of the story. This book is an eye-opener. 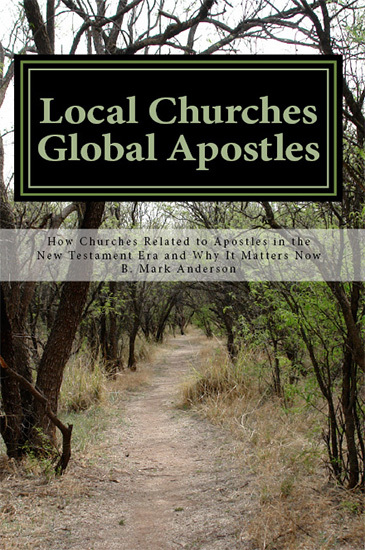 It focuses on how churches and church members related to apostles. You will discover what church members in Galatia thought of Paul. Here you find a fuller picture that will help you get a grip on the realities of church life and government—then and now. Perhaps nothing has created more confusion and trauma regarding apostles than the subject of authority. Based on fifty years of experience with apostles, the author carefully promotes and proscribes an apostle’s authority. He examines how NT apostles viewed themselves in relationship with early churches. Chapter 21 explains why some apostles become “dictators” rather than servants of churches. Section Three safeguards you and your church from common pitfalls while it simultaneously releases true apostles to fulfill their God-given ministries. Due to his thorough research and grasp of New Testament history, the author repeatedly brings you face to face with startling realities. Where else have you heard that Paul abandoned several of the churches he planted? Or that he started the church in Thessalonica and did not return for six years? Why was the Jerusalem church (which shared everything) so poverty-stricken? You will discover information you don’t see elsewhere! How should churches relate with modern day apostles? Why are some local churches ineffective? You will see some of the recurring patterns that made the New Testament churches so dynamic. All maps are large, clear and original. Each is a pleasure to study because you don’t need a magnifying glass to view them. 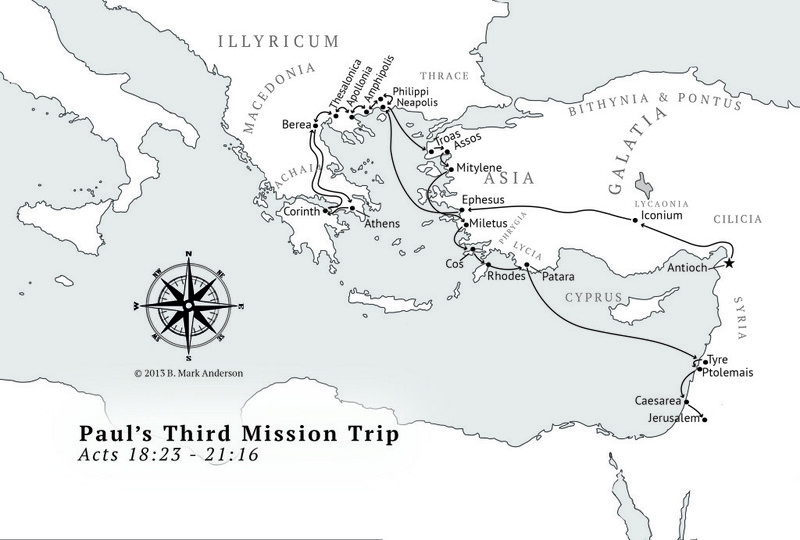 The never-before-published map of Paul’s second visit to Corinth will clarify a controversial event, bring you up-to-date with modern scholarship, and go a long way towards equipping you as an expert in NT history. No dry history here! You will feel with early Christians in Rome and Caesarea as you read their stories. What did Philips’s daughters think about Paul, the murder-accomplice of their father’s close friend? These historical vignettes invite you to imagine and feel the pathos of the people in first century churches. How many apostles are mentioned in the New Testament? Answer: twenty-five! When will the ministry of apostles cease? Many Christians believe all apostles died at the time of Peter and Paul, but the Bible tells when, and it hasn’t happened yet! Truly a ground-breaking expose . . .
—H. Clay Hudson – missionary to Romania and pastor emeritus of Grace Fellowship Church, Hampton, VA. I couldn’t put the book down . . . thoroughly enjoyed it. One of the finest Biblical studies . . . [regarding apostles] I have ever read. When you buy Local Churches Global Apostles, you get all this and a whole lot more. You get—an Education! Why were New Testament churches dynamic? How Paul could start a church, leave it for six years (Thessalonica), then return and find a thriving congregation. Due to the resurgence of the apostolic ministry in our day, some pastors and church leaders are asking, “Do I need an apostle?” “How can an apostle help our church?” “What do apostles do?” Some church leaders feel called into apostolic ministry. Some pastors and churches are wondering how to connect with trans-local ministries. Some churches feel neglected; others have experienced abuse by overseers. By returning to the roots, this Biblical study helps answer questions and encourages ministers and churches to work together in viable ways to build God’s kingdom. Mark Anderson has done efficient work in detailing not only the role of the apostle as evidenced in the early churches but of the characteristics of this early body of believers. He delineates the governing structure of the New Testament church and its application to our 21st century church. Pastors and lay people alike will benefit from this enjoyable, straightforward, fact-filled book. Anderson connects with leaders everywhere by taking us from his personal hurt in a critical relationship to a focused and thorough search of the N.T. Good things are afoot. Naturally problems arise. Anderson has put an important piece of the puzzle on the table for us. Easy to access. Anderson has served the kingdom well by his remarkably thorough examination of the biblical data regarding churches and apostles. In an age where true apostolic father’s are being restored to the church, Mark Anderson hits the nail on the head. Mark’s work is historical, theological and very pastoral. A must read in this hour. Very helpful and enlightening. An excellent study on the New Testament Pattern for the Church. I totally agree that the relationship between the apostle and the local church must be a father-son relationship. Get ready for a paradigm shift in how you view New Testament church life! Mark’s work may delightfully shatter your presuppositions as he brings fresh insight to how the first century apostles related to local churches. Thoughtfully researched and humbly written, Mark blends both Biblical insight and many years of pastoral experience to bring us this valuable book!